A missionary in Thailand passes on lessons he learned from trying to do too much. Jon and his wife, Marisa, grew up in Chiang Mai, Thailand, as the children of missionaries. Because he was raised here, Jon can’t remember a time when he couldn’t speak Thai. 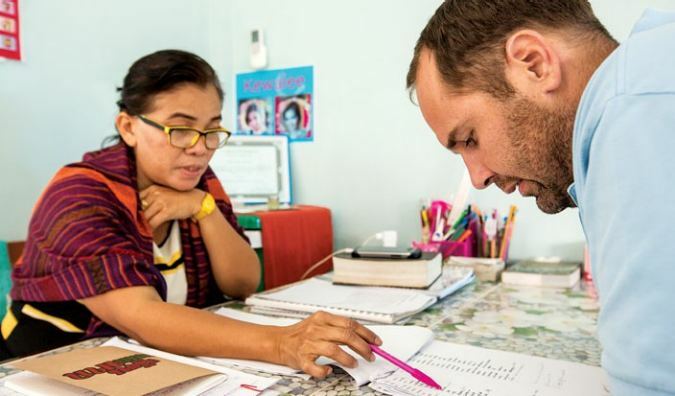 Yet now at age 36, he sits in a small room, walls adorned with children’s Thai alphabet illustrations, practicing a carefully chosen set of words. Facing Teacher Gaye, an older language instructor, and holding a sheet of paper in his hand, he begins. “C̄hlād - Mị c̄hlād” (Smart – not smart), he says in Thai. “Kherīyd -Mị kherīyd” (Stressed – not stressed). “You’re going too slow,” she scolds him, like a frustrated parent. For 20 hours each week, he’ll be studying and practicing, because the gaps in his language skills affect the depth of his relationships with people he cares about. Likewise, Jon sees a city of busy Christians who appear fluent in the language of the gospel, but often fail to experience God in the life-changing way He intended. The city of Chiang Mai, surrounded by lush green mountains, is home to approximately 2,000 Christian missionaries, with many more passing through annually. It’s an ideal location for a couple who feels called to nurture those involved in Christian ministry. Jon and Marisa’s experiences have led them to identify a subtle but insidious danger facing anyone working hard for the Lord. Busyness and activity can hide deeper issues. Jon’s concerned that the picture of Christianity being painted by some missionaries is, When I’ve worked myself to death and I can’t breathe, then God will be happy with me. He has seen the danger firsthand. Jon grew up thinking that he was a mistake made by God. He was diagnosed as a child with a severe learning disability, a form of dyslexia where letters would appear to be flipped around on the page. “The term they used was ‘deficit’. I had a deficit,” says Jon. It was hard on his family, who temporarily returned to the U.S. when he was 8 to get him additional support. He developed strengths to mask his weaknesses: riding motorbikes in the mountains, playing sports and becoming good with numbers. But he wouldn’t come to enjoy reading a book all the way through until the age of 28. He found success as a photocopier salesman: “I remember making $30,000 one month.” But when Jon became a father, he began questioning what was driving him so hard. Then on December 26, 2004, a tsunami ravaged parts of Thailand. As he watched news footage of the devastation, Jon knew it was time to change direction. He and Marisa became staff members with Cru in April 2005, and led teams of volunteers in rebuilding destroyed homes. But the move into ministry and change of location failed to address the underlying issues. In 2008, they joined the Cru team at the University of Arkansas. Jon dreamed of building the largest campus movement in America. The team saw a movement of 100 students grow to nearly 1,000 in four years. Jon experienced a severe case of what Christian ministries usually refer to as burnout. He exhausted himself striving to prove his own worth by building a successful ministry. He suffered anxiety-related stomach pains, and struggled to get out of bed for weeks. He was physically, emotionally and spiritually unwell. Jon believes he had lost touch with the God he was so busy working for. Stronger boundaries between family time and ministry, and having to lay down some responsibilities, allowed Jon and Marisa space to slowly recover. God was rebuilding this man whose strength was designed to hide his weakness, but whose vulnerability would become his greatest strength. Within a year they began feeling God calling them back to Chiang Mai, to share what they had learned. They returned at a time when, numerically, the ministry was declining. Every campus saw students coming to faith, but they were struggling to develop leaders. An annual leadership camp, which previously hosted up to 400 students, now had less than 50. Staff morale was suffering. The struggles opened a way for the message Jon and Marisa were bringing. But it took time. Jon and Marisa have spent almost two years using every opportunity to stress the importance of prioritizing relationships with God and each other above results. They’re beginning to see signs of a breakthrough. Colleagues previously afraid to admit their own exhaustion are confessing their desire to live differently. They’re looking to Jon and Marisa as a model of a missionary family. Jon recently began meeting regularly with Pastor P'-Pai (pronounced p-BAI), who leads a campus team while also pastoring a church. One afternoon at a McDonald’s, P'-Pai is struggling with his sense of failure regarding iServe, a city-wide event he organized. He’d hoped to involve 1,000 Christians in sweeping the streets on the king of Thailand’s birthday, but only 100 turned up. Jon sees a friend bearing too many responsibilities alone. He encourages P'-Pai with stories from his own life, reminding his friend that serving God isn’t all about results. “Jon’s taught me about balancing family and ministry,” says P'-Pai. “I want to help everyone, but Jon said, ‘Your first priority is your family.’” Jon is teaching him how to multiply his influence by delegating to others. Every Wednesday morning, Jon leads a personal development time with all the Thai Cru staff members. Standing in the middle of a coffee shop, he reads the parable of the pearl of great value from Matthew 13. Those gathered break into groups, divided by gender but also by seniority in the ministry, in keeping with Thai culture. Jon and the three senior leaders talk about stress arising from full-time Christian work. Their earnest tone is broken up by Jon’s laugh, like the giggle of a child with a baritone’s voice. When he speaks, he points repeatedly to his heart, teasing the conversation back to his original question about the pearl. Jon and Marisa share one message over and over again: God values us because He values us, not because of what we do. Slowly they’re developing a culture where people feel safe to talk about their struggles. They’re learning a new vocabulary for what constitutes fruitful ministry. Growing up in Chiang Mai has made Jon and Marisa a unique resource to other missionary families adjusting to life in Thailand. Their phones constantly buzz with questions being asked and needs being shared. But Marisa and Jon are watchful over each other. Family time, their marriage and time with God are all carefully guarded. Jon knows that when others depend on him, he feels valuable. He sees the threat that poses to all of his relationships. So he reminds himself daily that a God who doesn’t need him, values him even more.